After a night of looking at pictures of Lou Reed, John Cale and their co-horts from the 1960s, one can surmise The Velvet Underground never took a bad picture. Those black turtlenecks and the slim shades—the epitome of mid-60s lower Manhattan cool—was their uniform of choice, obviously, and with Andy Warhol as a guide, they tuned into the power of image as readily as the power of the drone. Perhaps you already had the VU at the top of your list of cool, but a new multi-media art and music exhibition in New York drives home the central role of photographic iconography that defined the act as much as its experimental twist on rock & roll. 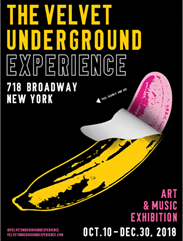 Short on memorabilia, artifacts and rare recordings, The Velvet Underground Experience is a banquet of photos that starts with each member’s childhood and moves through the band’s eventual breakup in 1970. Visited during the opening night party, with “I’m Waiting for the Man” seemingly on an endless loop, the exhibit is rich in detailed information; a second visit is needed to fully take in the voluminous amount of material. It’s very much the Lou and John show, and A film on the lives of Reed and Cale prior to their forming the VU is one of the exhibit’s must see stations. Still, ample space is allotted to Maureen Tucker, Sterling Morrison, Nico and Doug Yule along with the visual artists associated with the VU. The exhibit, set up at 718 Broadway through 12/30, starts with historic photos of Greenwich Village, Allen Ginsberg, folk musicians and protests, suggesting that these events and individuals were key to the VU’s origins. What we don’t see is much of are the places where the band made its name, chiefly Warhol’s Factory, the Chelsea neighborhood and the Lower East Side where Cale worked with La Monte Young and others in the modern classical world. Opening week events include a Q&A with Cale tonight in the new Bandsintown Studio in the building, and a concert by The Feelies on Saturday at White Eagle Hall in Newark, N.J.